Long term crop responses to applied N and P.
What are we seeing 18 years on? Learning from long term experiments - what do they teach us? 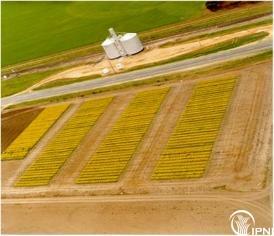 The Dahlen N and P experiment was established in 1996 in the medium rainfall cropping zone of Victoria, Australia, and has been in a canola, wheat, barley, and pulse rotation each year since then. The experiment has four rates of P (0, 9, 18, 36 kg P/ha) applied at sowing, and five rates of N (0, 20, 40, 80, 160 kg N/ha) either all at sowing or split. Crop and soil data has been collected for each crop year, which included two years where crops were sown, but not harvested, due to drought. The Dahlen nutrition experiment was established by Incitec Pivot Fertilizers in 1996 to investigate the interaction of different rates of N and P within a modern cropping system (i. e. , retain stubble, no-till) on a Vertisol. Since establishment, the site has been in a canola, wheat, barley, pulse rotation (with oaten hay in 2011) on factorial combinations of annual applications of N (0, 20, 40, 80, and 160 kg N/ha as urea) and P (0, 9, 18, and 36 kg P/ha as triple superphosphate). The long-term profitability of N and P use has been assessed at the Dahlen field experiment established in 1996. In 2012, the site was sown to wheat. The addition of 9 kg P/ha gave about a 1 t/ha yield increase (30%) while extra P gave no further significant responses. The first 20 kg N/ha gave a 0. 6 t/ha yield increase (14%) and the highest yields occurred with 80 kg N/ha. The high N rate increased grain protein, but had no effect on grain test weights. The Dahlen long-term N and P experiment was established in 1996, and has been sown to a canola, wheat, barley, and pulse rotation each year since then. Treatments included four rates of P (0, 9, 18, 36) applied at sowing and 5 rates of N (0, 20, 40, 80, 160) applied either all at sowing or as a 50:50 split between sowing and the start of reproductive growth. Established in 1996, this long-term site at Dahlen, 10 km west of Horsham, has had five rates of N (0, 20, 40, 80, 160 kg as urea) and four rates of P (0, 9, 18, 36 kg as triple superphosphate) applied annually over the past 16 years. The site has been direct drilled and no stubble has been removed or burned. In 2011, the site was sown to oats in mid-May as a hay crop and the standing crop cut on 20 September when the plants were still in the flag leaf growth stage. Since establishment, crops planted included barley (1996, 2000, 2004, 2008), chickpeas (1997), canola (1998, 2002, 2006), wheat (1999, 2003, 2007), and lentils (2001, 2005). Canola was chosen as the 2010 crop, following lentils in 2009, and barley in 2008. With good seasonal conditions, canola showed a strong response to P with the first 9 kg P/ha doubling yields and the next 18 kg P/ha plots raising yields to over 3 t/ha. Since its establishment, crops planted included barley (1996, 2000, 2004, 2008) , chickpeas (1997), canola (1998, 2002, 2006), wheat (1999, 2003, 2007) and lentils (2001, 2005). Canola was chosen as the 2010 crop, following lentils in 2009 and barley in 2008. With the good seasonal conditions, canola showed a strong response to phosphorus with the first 9 kg P/ha doubling yields and the next 18 kg P/ha plots raising yields to over 3 t/ha (see Figure 1).